It wasn't until 1807, when Jefferson began to anticipate his retirement from the presidency, that the flower gardens began to assume their ultimate shape. 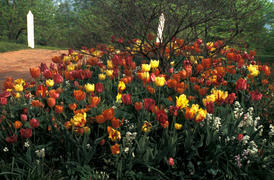 He then sketched a plan for the twenty oval-shaped flower beds in the four corners or "angles" of the house. Each bed was planted with a different flower, and most of the seeds and bulbs had been forwarded by Bernard McMahon, a Philadelphia nurseryman, author of The American Gardener's Calendar, and in many ways, Jefferson's gardening mentor. Although there were later notations concerning plantings in the oval beds in Jefferson's Garden Book, the 1807 plan was the most complete. The diversity of flower species represents the scope of his interests. Many of the flowers had been grown for centuries in Europe and were commonly cultivated in early American gardens, such as roses, the Sweet William, and the double white-flowering poppy. Others were curiosities, such as the winter cherry with its lantern-like fruits and the blackberry lily. One bed was planted with twinleaf, Jeffersonia diphylla, a rare, woodland wildflower that was named in Jefferson's honor in 1792 by Benjamin Barton, a noted early American botanist.